The subject is pears. Did you know there is an entity called Pear Bureau Northwest? Really. There is, I swear! According to their website, “The Pear Bureau Northwest was established in 1931 as a nonprofit marketing organization to promote, advertise and develop markets for fresh pears grown in Oregon and Washington.” Did you know that Oregon and Washington together produce a whopping 84 percent of all the fresh pears grown in this country? Apparently it’s our volcanic soil, yearly rain deluge, and toasty summers that seal the deal. Alright! Pears! We loves ’em! So when the good folks at Pear Bureau Northwest invited me to lunch at Lauro Kitchen on SE Division, I RSVP’d with a blinding speed known only to starving interns. The event was partly to honor Lauro Chef Jennifer Buehler’s winning recipe in the bureau’s "Pear Panache" program, and partly to let guests sample the latest tastes in peardom. The Red Anjou pears were an intriguing addition in both the pizza and the salad. The pizza in particular was a sweet and salty surprise with its crackly thin crust supporting a pairing of pears and smoked prosciutto that coexisted in superb harmony. Then came the dish we’d all been waiting for: Buehler’s recipe featured lamb shanks that had been braised for hours alongside caramelized Bosc pears and shallots, and garnished with pistachio couscous. The magnificently sweet aroma rose in the steam as the tender lamb fell apart before our widening eyeballs. Buehler says she loves cooking with pears because they’re a sweet and versatile ingredient but they can also stand alone as a dessert or side dish. Buehler’s winning recipe, below, has been modified for home cooks. If you prefer someone else to do the braising and sautéing for you, Buehler’s entree is currently on the menu at Lauro Kitchen. Prepare the lamb by seasoning with salt and freshly ground black pepper. Heat the oil in a heavy, wide sauté pan until it is very hot, but not smoking. Brown the lamb shanks 2 at a time, turning them so that each side is dark golden brown and crusty, about 12 minutes total. Remove the shanks from the pan. Reduce the heat under the sauté pan to medium high and add the onions, garlic and ginger. Cook stirring frequently until the onions begin to caramelize slightly and pick up the color and scrapings leftover from browning the meat, about 5 minutes. Put the shanks in a deep, wide casserole, or a roasting pan. Add the sautéed onion, garlic and ginger to the lamb shanks along with the saffron, ground cinnamon, ground ginger, black and cayenne peppers, bay leaves, cinnamon stick and almonds. Cover the shanks with the chicken stock adding a bit of water if necessary to cover them completely. Cover tightly and braise for about 3-1/2 hours, adding the dried cranberries during the last 30 minutes. To finish the sauce, melt the butter in a sauté pan with the oil over medium heat. Halve or quarter the larger shallots. Add shallots to the pan and sauté gently until they begin to soften slightly, about 5 minutes. Add the pear slices and sugar and continue to sauté until everything is golden brown, about 15 minutes. Add some chicken stock or water if the sugar begins to get dark. Remove the lamb shanks from the braising liquid. Transfer the braising liquid to a separate saucepan, put the shanks back in the braising pan and keep them warm. Add the pears and shallots to the braising liquid and reduce slightly. It will already be fairly thick. Add salt and pepper as needed. 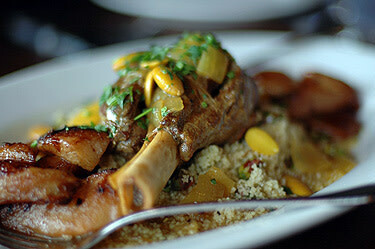 To serve, while the sauce is reducing, put the couscous on a larger platter and arrange the lamb shanks on top. Garnish with some pear slices and shallots and spoon the reduced sauce over the meat. Optional: sprinkle with parsley and serve with plain yogurt on the side.